As you know, new IBM System i Power9 and Power8 systems do not have local Twinax Workstations Controllers. What do you do with your current investment in Twinax printers and terminals?? In addition, IBM plans to eventually eliminate support for old SNA Twinax Remote Controllers. To a lot of users this is a major financial concern. Their large investment in Twinax terminals and printers currently installed at their local and remote locations can add a great deal to the cost of moving to a new system. We have the perfect solution for these users that want to keep this current investment in peripheral equipment productive. This frees up more of the budget for things that will make a difference. Why spend money to replace a printer that works with a new printer, or a terminal that's doing the job with a new terminal? The Xip+ Twinax Controller and eTwinax Controller are Twinax Controller that runs Pure TCP/IP - no SNA, ANYNET or DLSw protocols can extend the productive life of these assets for years to come. These Twinax-Over-IP Controllers can simply be looked at as "External" Twinax Controllers for the Power9, Power8 or any model iSeries AS/400. If the answer is "yes" to any of the following questions, these "External" Twinax Controllers will let you keep your existing Twinax infrastructure and eliminate your concerns. Are you getting a new System i Power9 or Power7 with no internal Twinax Workstation Controllers? Are you switching to a TCP/IP only environment but have an investment in Twinax Printers? Are you relocating your i5, iSeries or AS400 to a different location and want to avoid the cost of re-cabling? Are you planning to implement High Availability (HA) or Disaster Recovery (DR) plans? Are you moving your system to a new location in your current building? Do you need to eliminate SNA communications to your remote locations that currently have IBM, Perle or other compatible Twinax Remote Controllers? Are you eliminating remote AS/400s but still need to support Twinax CRTs and printers at the remote locations? You can get more information by visiting the Xip+ Twinax Controller and eTwinax Controller pages or by filling in the Information Request Form at the bottom of this page. 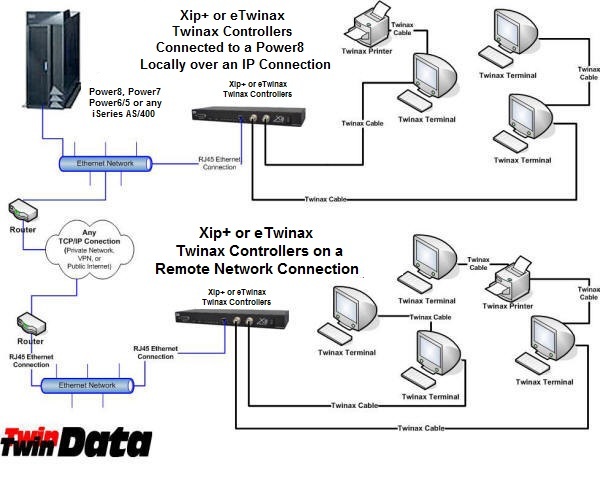 The diagrams below illustrates these Twinax Controllers fit in a local configuration as well as a remote configuration. The same diagram applies to both Controllers. Local Connection - to provide connectivity of your local Twinax CRTs and Printers to an System i Power9, Power8, iSeries or AS/400 that does not have Twinax Workstation Controllers. You can also use these two Twinax Controllers connected in this manner to provide full support of your Twinax Devices in a High Availability scenario. Remote Connection - to provide TCP/IP connectivity for the Twinax CRTs and Printers at your remote locations that are currently connected to IBM 5494/5394, Perle 594/494 or other compatible Twinax Remote Controllers. Also for supporting locations where you currently have an iSeries that will be eliminated when you upgrade to a more powerful i5 at your host location.